Seventy-two-year-old Edgar recently picked a new primary care physician. After two visits and exhaustive lab tests, the doctor said Edgar was doing "fairly well" for his age. A little concerned about that comment, Edgar couldn't resist asking the doctor, "Do you think I'll live to be 80?" The doctor asked, "Well, do you smoke or drink beer?" "Oh no," Edgar replied, "I've never done either." Then the doctor asked, "Do you eat rib-eye steaks and bar-b-qued ribs?" Edgar said, "No, I've heard that all red meat is very unhealthful!" "Do you spend a lot of time in the sun, like playing golf?" the doctor asked. Then the doctor asked, "Do you gamble, drive fast cars, or run around with women?" "No," Edgar said, "I don't do any of those things." 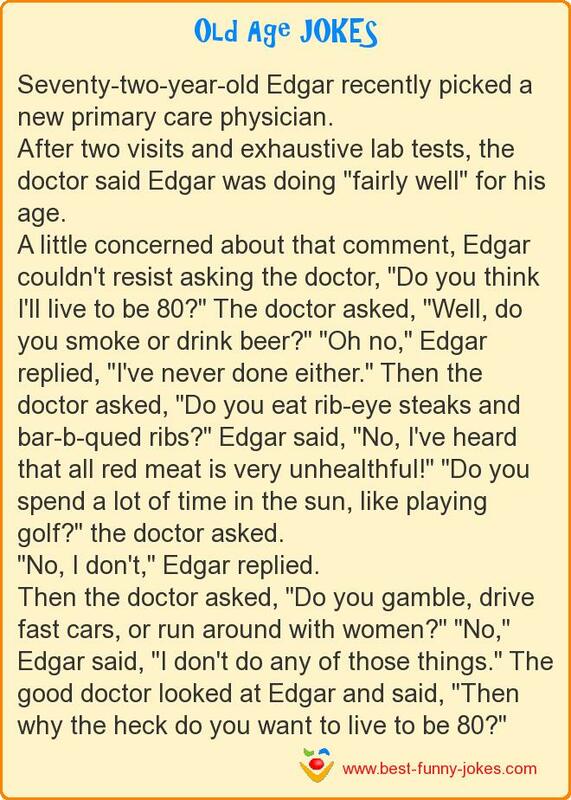 The good doctor looked at Edgar and said, "Then why the heck do you want to live to be 80?"